Worried about your next job interview?? Well don’t be! There are certain steps you can take in advance to prepare! Here are 8 simple Interview Tips to help you ace your interview and walk into your dream job. Remember, you never get a second chance to make a first impression , so you’ll want to do your best on preparing for your interview in advance! 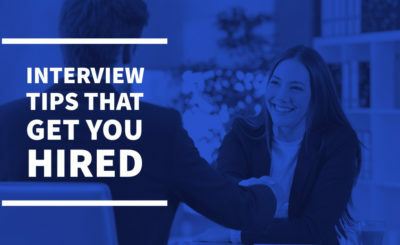 Here are some interview tips we at Chase recommend before your interview! Appearance is a crucial part of your interview, it paints a picture of your personality and your professionalism. Make this critical part of the interview yours by choosing a professional look. Remember first impressions are vital in building perceptions! Take time and plan your outfit, once decided make sure it is ready to go. It doesn’t hurt to try the outfit on ahead of time, just to make sure everything fits. A very important interview tip is setting off the right energy from the very start. This is an opportunity to grab the interviewer’s attention by transferring your energy and enthusiasm through your smile and firm handshake. Handshakes and welcoming smiles can be practiced! These are simple steps that you should be able to prefect from the start. There are regular common interview questions in which you can practise for. By doing a small bit of research you can find out some of the most common questions which are asked to potential candidates. These questions usually occur at the beginning of the interview so it’s a great way to ease your way into the interview. By answering these questions effectively it will also install a bit of confidence in yourself . Common questions include “Tell me about yourself” and “Why do you think you would be great for this job?”. These interview tips can help separate you from other candidates! 4. Know your CV:Your interviewer will most defiantly make reference to your CV and some work experience or skills you have listed on it . Any information included in your CV means it’s fair game to talk about during the interview. However, your CV is your opportunities to show case your skills and previous experience. Having the ability to talk and make reference to your skills and past experiences can impress your interviewee. This is one step you absolutely won’t want to skip and is a top interview tip. Remember practise makes perfect and you should consider doing a few practise interview! Getting a family remember or friend to interview you is ideal. This gives you the opportunity to practise and adapt. The more mock interviews you participate in the better. Challenge your mock interviewer to ask their own questions and off beat questions to see how you respond .After the interview ask for feedback on your answers, your body language and your preparation. Only 30% of communication is spoken. So remember and be mindful that non-verbal communication can speak volumns. Simple things like smiling ,establishing eye contact and a firm handshake can all project confidence. A good firm inviting open posture is another effective interview tip. Be aware of nervous gestures such as foot-tapping and try to minimise as much as possible. By writing good non-verbal communication techniques on a list before your interview can help with remembering it during your interview. Vital that you also analyse your interviewers body language and respect their space. Finding out as much information as possible about companies is relatively easy in today’s world due to the internet. The easy access to things like the company website, profile, background and mission statement put candidates in a great position to find out information about the company. This portrays to the interviewees that you have prepared effectively and willing to do extra work to proceed ahead. Another effective process is acknowledging the job position and skills need. Try to make reference to skills in which you have in relation to the job description. Remember an interview is a two-way street. Your potential employer is asking you questions to learn about you and your skills. In return, you need to prepare questions to ask your potential employer about the position, your boss, and the company in order to be sure that this is the right job for you. Challenging questions to your interviewee demonstrate your interest. By preparing questions it also gives you to opportunity to see if this is the right job for you. Try to use open ended questions to your interviewer to challenge them with their response. This can make you more memorable and be the factor that separates you from other candidates! On behalf of Chase we hope these interview tips are beneficial to you and help you with your preparation for your next interview!